It’s hard to believe that our amazing summer in Tel Aviv has come to an end. When reflecting on the last eight weeks so many different emotions are brought up. Thinking about the crazy adventures and times the group had immediately makes me smile. We had such a unique summer experience and it’s one we will all carry with us forever. The sign for the street our apartment was on, which has now become our second home. I feel grateful when thinking about our summer and Tel Aviv. I am so incredibly thankful that this was how the group and I got to spend our summer. I’m thankful to have been given this opportunity to get to know Israel, my group mates, and to learn more about the profession I’m interested in. I’m grateful for the 21 other people I got to experience Israel with and thankful for the friendships I made. I can’t imagine this trip would have been half as fun if I hadn’t had this group of people with me. I know it might sound cliché but I wouldn’t change the way our trip went if I could. Even when the group had long days of travel or when it was too hot out to stay outside very long, we still found a way to have fun during every moment. I’m going to miss all of our shared meals and snacking. We’re all going to miss the unreal delicious restaurants around our apartment. Going out to dinners together as a giant group is something I’ll really miss and that I’m grateful for. Jordan Seibold and our Madricha Niva enjoying some fresh pressed juice. I’m also thankful for our amazing Madricha (advisor) Niva, who went above and beyond what any of us could’ve hoped and who always made us feel like Israel was our home. By the end of the trip, Niva had become a friend to us rather than just our team advisor, she always wanted to hang out with us all and organized the best activities for us. We’re all so grateful for the location of our apartment and being able to walk to the beach almost every day of summer. The beach was one of our favorite places to hang out as a group and if you’ve read the other blogs I’m sure you’ve seen me mention going there in about every post. We really loved being able to swim in the sea and it was such a great place for us to all hang out and to hang out with people from other Onward Israel groups. That’s something else that was so cool about Onward, being able to meet people from all across the world and see how we can all come together. Ali Richter, Sophie Greenberg, and Sami Abel enjoying a meal in Tel Aviv. I also feel a tiny bit sad when thinking about our summer. Not sad because of anything that happened but sad because it’s over. Being back in Cincinnati feels more like a vacation and that in a few weeks I’ll be heading back to Israel for more. It still feels weird going home to my house in Cincinnati instead of to our apartment in Tel Aviv and piling on our big couch all together to watch Netflix. Unfortunately, our Onward journey is over, but this summer helped to create a bond with Israel that we will always have. In my first blog I mentioned that I decided to apply for Onward to get out of my comfort zone, and that I thought I had made the right decision. After eight weeks on the program and another additional week of extending, I can confidently say that this summer was the best decision I could have ever made and I’m so glad to have spent my time in Israel. 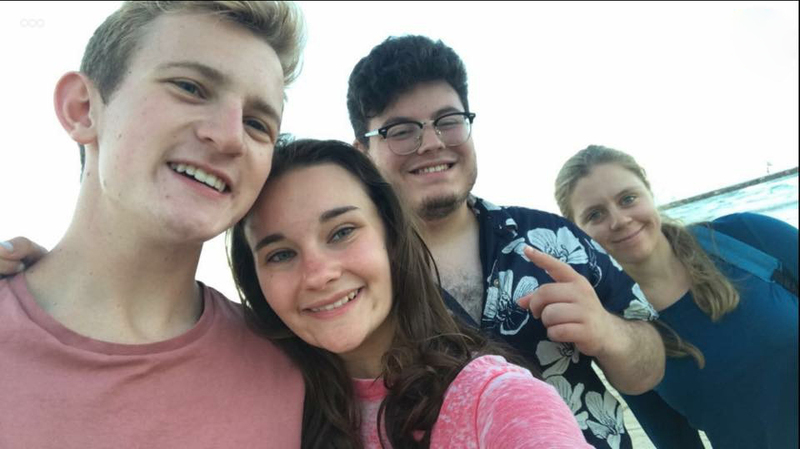 Left to right: Maddie Smith, Mason Williams, Bradley Bolotin, and Susan Brownstein enjoying the beach. Sam Myers, Reagan Heck, Ezra Babcock and Jordan Seibold selfie-ing on the beach.